Every family, however you define it, has its own Christmas traditions. At least those families who observe Christmas, which we do at Darlington House. I celebrate Christmas for the enjoyment of the holiday, and also for the spiritual message that inspires it, and me. There are a number of Christmas traditions that we observe at Darlington that I brought with me from my birth family, and there are ones of a more recent vintage that we have made our own. 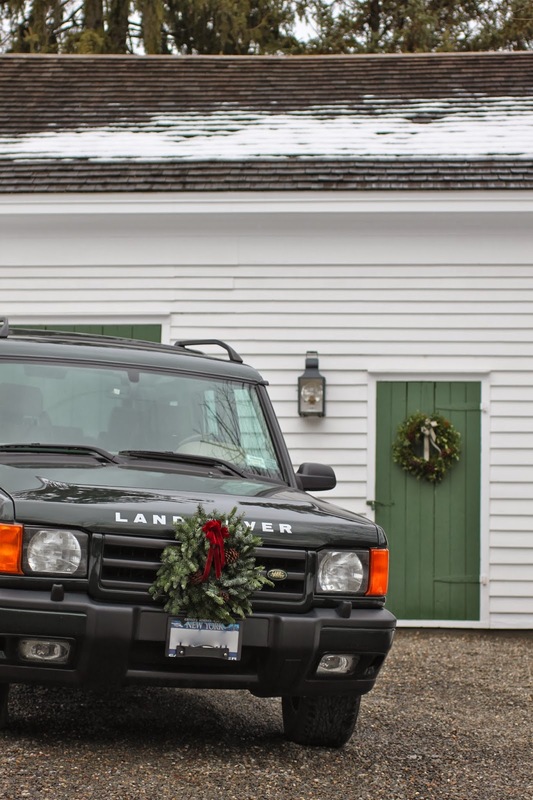 As I have written before, one tradition that I observe at Christmas is to adorn the grill of our Rover with a wreath. 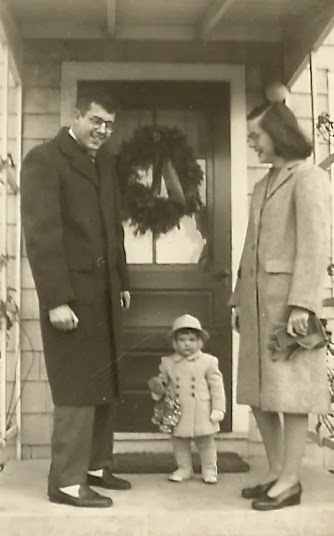 My mother, MD, decorated her cars with a wreath when I was a boy. I loved it then, and I love it still. This year we ordered our Rover's wreath from the good ladies of Cedar Farm. I think they did a lovely job of it (they also made the wreath shown in the background, hanging on a door of one of our barns). Another Christmas tradition I observe is to set out a crèche. MD was mad for crèches, and collected more than a dozen of them over the years. The one we have at Darlington is a dime store crèche made in Italy in the 1950s that I bought at a Groupe Shoppe years ago. I've been adding figures to it ever since. If you look closely at the photograph you'll see that there is a little pug, given to me by my sister Camilla, among the adoring throng. I also have a collection of Black Forest bears that I put out at Christmas. I inherited the nucleus of the collection from my mother, who inherited it from her father. I've added to it over the years, and I put the bears on the mantel in our Snuggery, along with half a dozen or so little Steiff toy animals that I played with as a child. I've had some of them for almost fifty years. When it comes to food and drink we have a number of traditions at Darlington. I always make sure to have a box of Darling clementines on hand at Christmas. 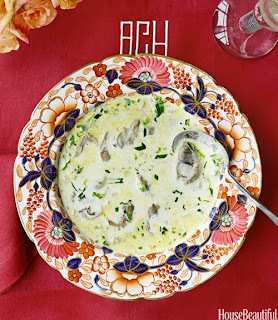 Every Christmas Eve, before attending the evening festival service at the Episcopal church in the nearby town (assuming I can stay awake—and sober enough—to attend it), I make a simple oyster stew, a dish that my sister Hermione introduced me to as a Christmas Eve tradition many years ago. 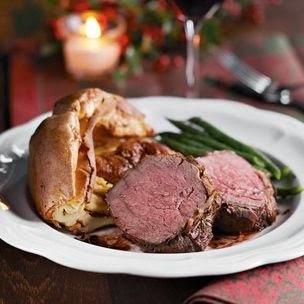 On Christmas day we tuck into an old-fashioned English dinner of prime rib roast and Yorkshire pudding (recipes courtesy of my dear friend Lindaraxa), followed by Stilton cheese and Christmas pudding with hard sauce. MD adored hard sauce. In years past, when Fauchon still had an outpost in Manhattan, we used to put in a store of their sublime pâtes de fruit and marron glacé to eat over the Christmas break. 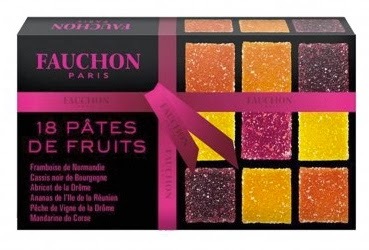 Now we console ourselves with chocolates and other treats, including blinis heaped with caviar or salmon roe and crème fraîche. Champagne is usually within easy reach. Another tradition of ours during the Christmas break is to drive to Albany, New York State's capitol, and have a festive lunch at the city's venerable Jack's Oyster House. 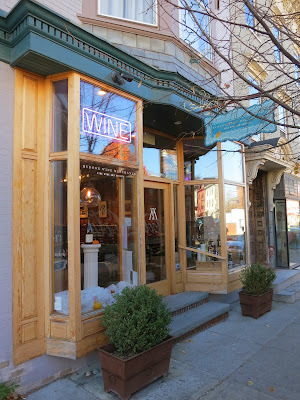 It's been an Albany institution for one hundred years now. 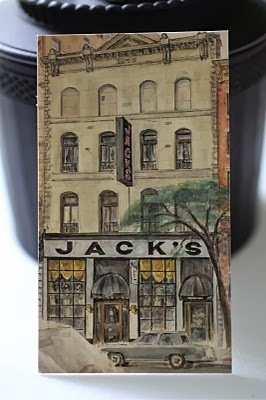 Jack's is usually packed this time of year with tables of happy revelers out for a holiday lunch. We heading there for ours today, in fact. A more recent Christmas tradition that we've added to our repertoire at Darlington is dipping into the most delicious egg nog imaginable, made by our friend Ted Greenwood. Ted makes a large batch of it from an old family recipe every year and distributes it on Christmas Eve to his lucky friends in Ball jars. He calls it Ted Nog. It is beyond yummy, particularly when adorned with a bourbon or rum floater on top. Needless to say, Ted is very popular with his fortunate friends this time of year! 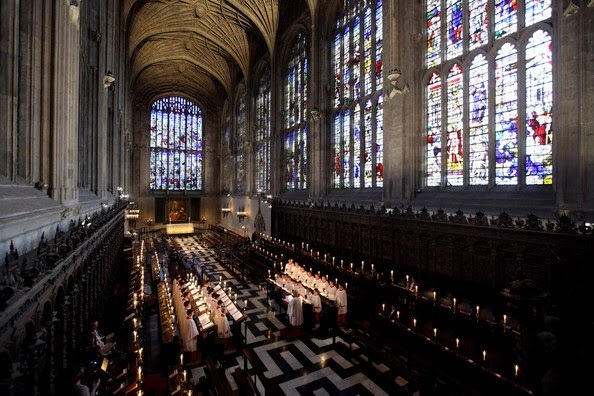 Another tradition I look forward to every Christmas is listening to the Festival of Nine Lessons and Carols sung by the choir of King's College Cambridge, and broadcast on our local public radio station on Christmas Eve. Of course we hang garlands and wreaths and put up a tree at Darlington, and we decorate the house festively for Christmas. But, then, that's the subject of another post, soon to follow. . .
a hospital thrift store ten years ago. Tell me, Dear Reader, what are some of your Christmas traditions? 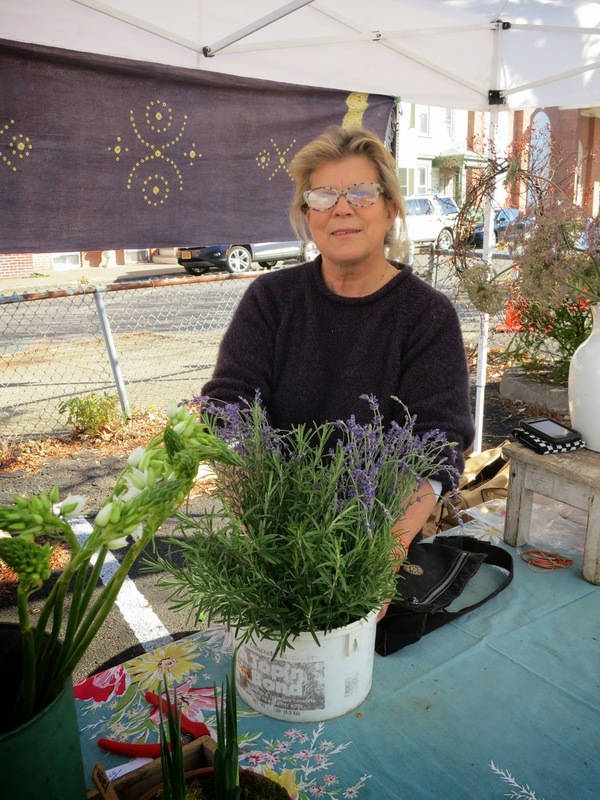 I received a package the other day, Dear Reader, containing an unexpected and thoughtful gift from the owners of Agraria, a home fragrance company based in San Francisco. It was a box of their Bitter Orange potpourri, which I have been a devotee of for thirty years. 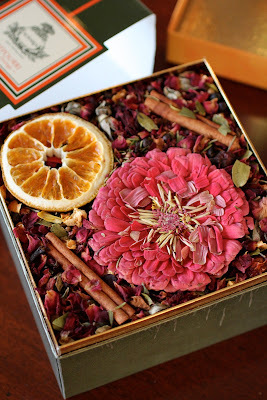 I first wrote about my love affair with Bitter Orange potpourri two years ago, which is how I came to the attention of the folks at Agraria. They have been kind to send me a present of a box of their Bitter Orange potpourri each Christmas since then, much to my surprised pleasure. I have never done a paid endorsement of a product here on Reggie, Dear Reader, and I don't expect to start doing ones any time soon, either. 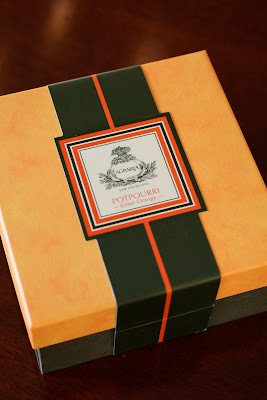 In this case, because the gift from Agraria was sent to me as a "thank you" for an unsolicited review and not in exchange for it, I am happy to recommend Agraria's Bitter Orange potpourri to you. If you are anything like Reggie is, he is confident that you will also fall in love with Bitter Orange's marvelous, can't-live-without, heady scent. That is, if you haven't already. . . I'm not, in general, a fan of potpourri. Most of what is available today is vile, made of things like artificial peach scented cedar shavings. No wonder it has such a bad reputation. 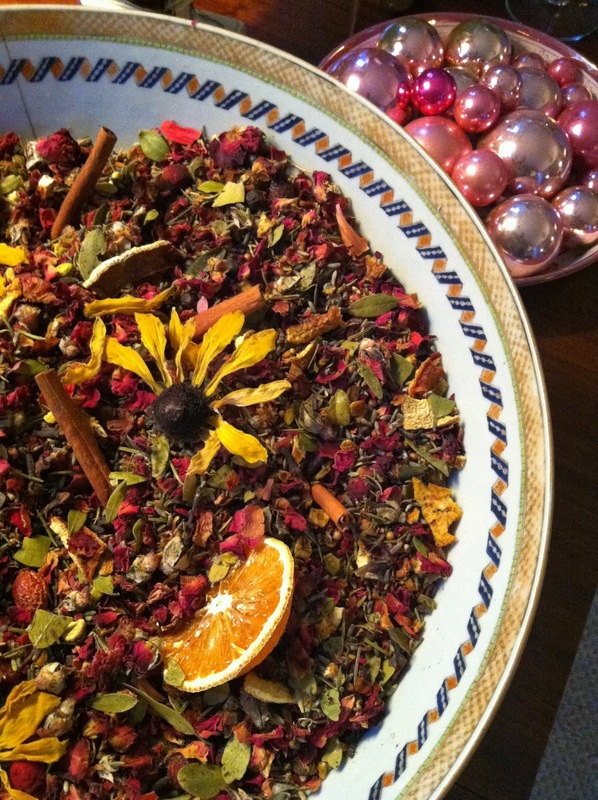 However, there is one potpourri out there that I love, and which I make a point of buying every year when the weather turns cold and the heating season begins. It is called Bitter Orange, and it is made by a company called Agraria. I recommend it to you, Dear Reader. It is the most marvelous potpourri there is. 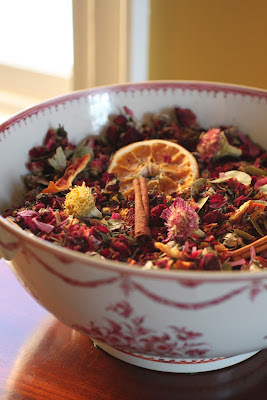 Agraria makes its Bitter Orange potpourri in small batches of fragrant dried flowers and orange slices, cinnamon sticks, cloves, lavender, natural oils, and other exotic organic ingredients. Bitter Orange is lovely—citrusy, floral, spicy, and woodsy. I fill an antique Chinese export bowl with it every year at this time and place it in our drawing room at Darlington House, where its scent deliciously pervades the room. I first learned of Bitter Orange back in the early 1980s, shortly after it became available in New York. I vividly recall my introduction to it, in the living room of a large apartment on the Upper East Side that belonged to the parents of a classmate of mine from Yale. I remember sitting in a chair in the room and wondering "What is that marvelous scent, and where is it coming from?" and my then delight in learning that it was a potpourri called Bitter Orange from a small company named Agraria, based in San Francisco. The mother of my friend had just bought it at Henri Bendel, the only store in the city that stocked it at the time, and she was quite pleased with herself for having done so. At the time I had never seen or smelled potpourri before. It seemed rarefied and exquisite to me, and I was entranced by it. This was long before potpourri had become a degraded mass-market commodity found in every gift-shoppe, drug store, and big box retailer in America. It was very special, then. Bitter Orange created a sensation in New York when it was introduced to the city in the mid-1970s, where it became known as "the Park Avenue potpourri," as it was immediately popular among the city's uptown smart set. I had to have it. I went to Bendels at the next opportunity I had and bought myself a box of it. I was shocked at how expensive it was, but that didn't deter me. I simply had to have it. And I've been buying it ever since. Agraria's Bitter Orange has spawned many imitators over the years, but none have succeeded in replicating its signature scent or quality. It is unique. Bitter Orange was the foundation of Agraria's subsequent success, and today the company's products are widely distributed, a testament to its vision and the integrity of its offerings. I'm pleased that they have been so successful. 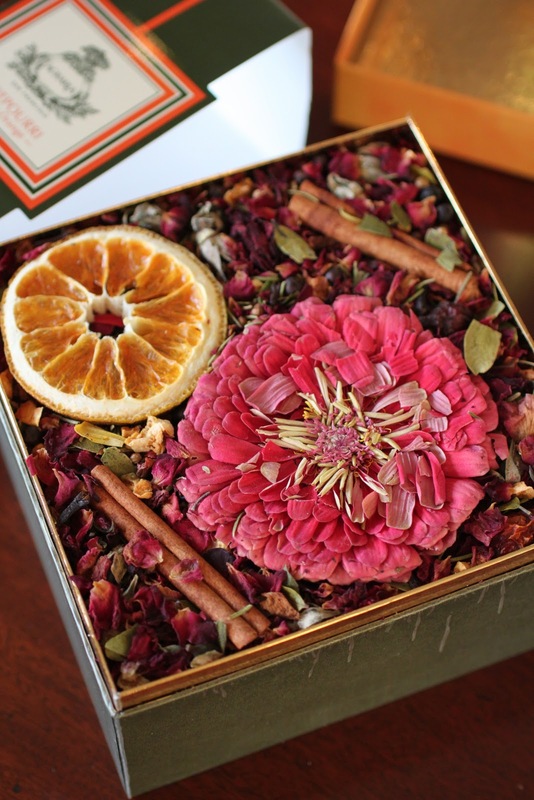 If you are not already a fan of Agraria's Bitter Orange potpourri, Dear Reader, I recommend that you get some, because I trust that you will love it, as I do. But be forewarned: it is addicting. Agraria's website, which features not only their Bitter Orange potpourri and related products, but also a host of other gorgeously-scented irresistibles, can be found here. Basil's First Darlington Christmas Begins . . . Boy tells me that I am wasting too much time and too many images by posting on my Facebook page instead of here at Reggie. He thinks I've been neglecting you, Dear Reader. So I'm going to do something about that. 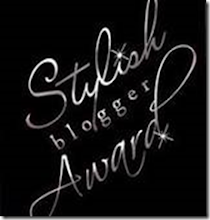 I plan on adding more short-and-sweet mini posts here to augment the longer, wordier, image-filled posts I've been doing for most of this past year. The migration of my shorter posts to FB is one of the reasons I've been posting less frequently here at Reggie. Today's post follows through on my resolution. 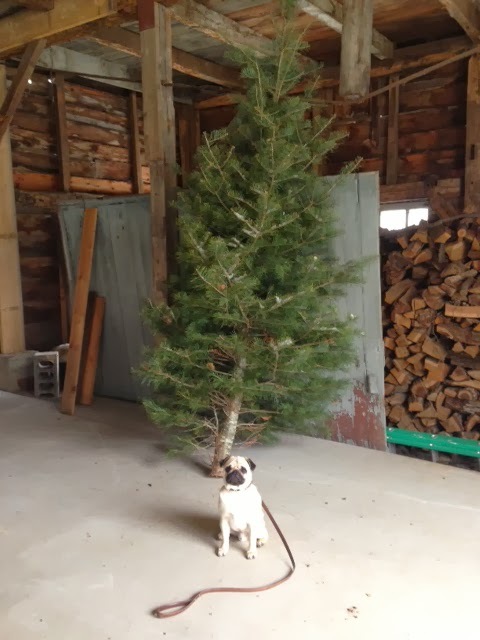 It features a photograph of our sweet little Basil sitting on the floor of one of our barns at Darlington, with our newly cut Christmas tree—an Abies concolor, commonly known as a Concolor Fir—waiting in the background. Boy cut the tree down this morning at a nearby Christmas tree farm with the assistance of our wonderful handyman/groundsman/all-around-helper/godsend Rich (just as he did last year, too). We plan on putting the tree up in our drawing room next weekend, with the assistance of darling Basil, of course. Given what Boy has told me about his plans to decorate this year's tree, I am sure it will be one of the most beautiful we've ever had. Needless to say, Basil is beside himself with excitement! Today at the Farmers Market in the nearby town to Darlington I was pleased to find that fresh Brussels sprouts were still available, even though there is now a dusting of snow on the ground in the Hudson River Valley. 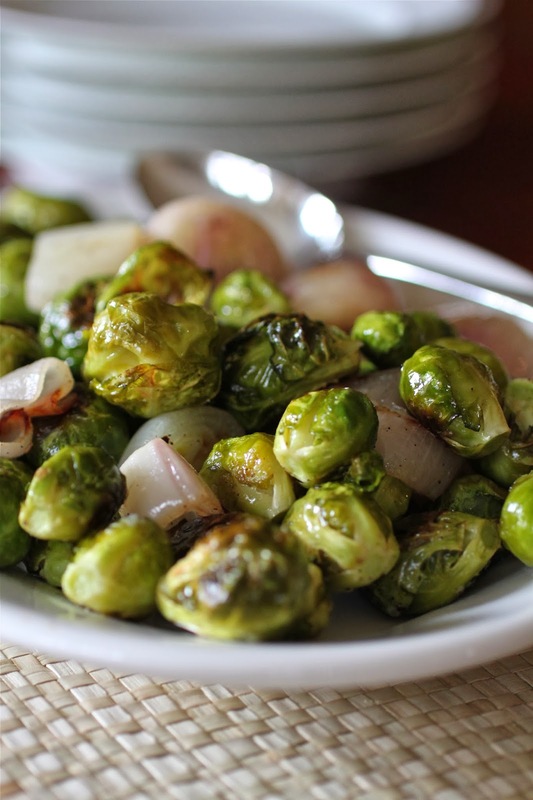 As I've written before, Dear Reader, Brussels sprouts are one of my favorite vegetables. 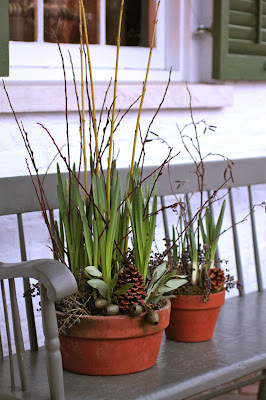 It was only as an adult that I learned that the little darlings grow on a stalk. As a child I knew them only from the frozen packages that MD bought at our local supermarket. By the time I entered college I learned they were also available in an unfrozen state, usually packaged in little paper buckets sealed with cellophane. 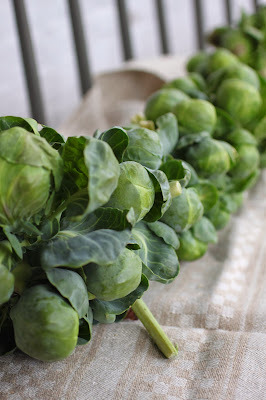 Today I prefer whenever possible to buy Brussels sprouts on the stalk, as I know they will be the freshest of all. Fortunately one can find them that way at our local Farmers Market in late autumn, when they are in peak season. 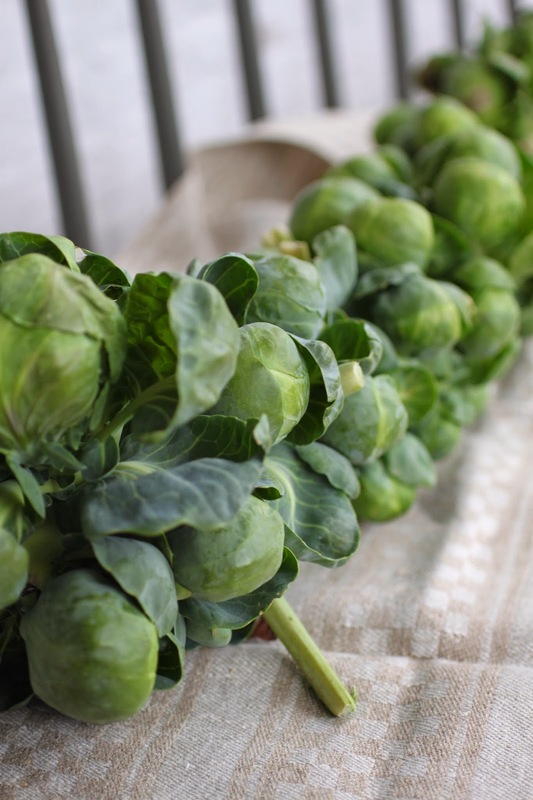 We like to roast or sautée Brussels sprouts at Darlington, preferring these methods of cooking to steaming them or, as MD did, boiling them in water. As I've written before, MD was an uninspired cook, and her Brussels sprouts (along with most of the vegetables she cooked) were a soggy, sodden affair. 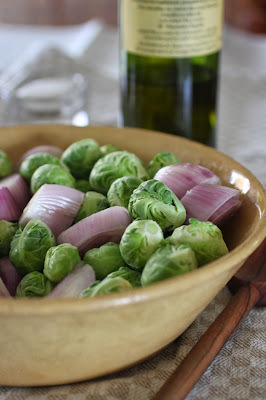 I'm sure that MD would approve of the way we cook Brussels sprouts today at Darlington, which is to toss them with olive oil, liberally season them with ground pepper and salt, and (often) combine them with other winter vegetables (I'm showing them here with shallots). Roasted in a hot oven until caramelized and tender, they are positively ambrosial. 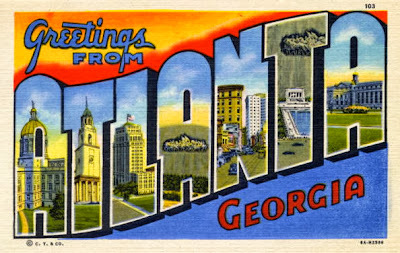 Today's post is the second part of my two-part series on Reggie and Boy's whirlwind visit to Atlanta, the Biggest, Boomingest City of the South. You can read the first part here. After an evening spent engaged in imbibulous shenanigans at Reggie's Bloggers & Bankers cocktail party, your sainted author was feeling a bit the worse for wear the next morning and needed to ease back into the land of the living. And what better antidote is there for such an overindulgence than a Four Seasons room-service breakfast wheeled into one's chamber? Fortified by our delicious breakfast (and several aspirin) we headed out the door to take in Atlanta's sights. 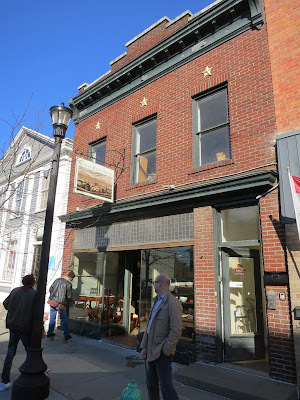 As we often do when on a Reggie Roadtrip, we began our day by visiting a number of the city's antiques stores. 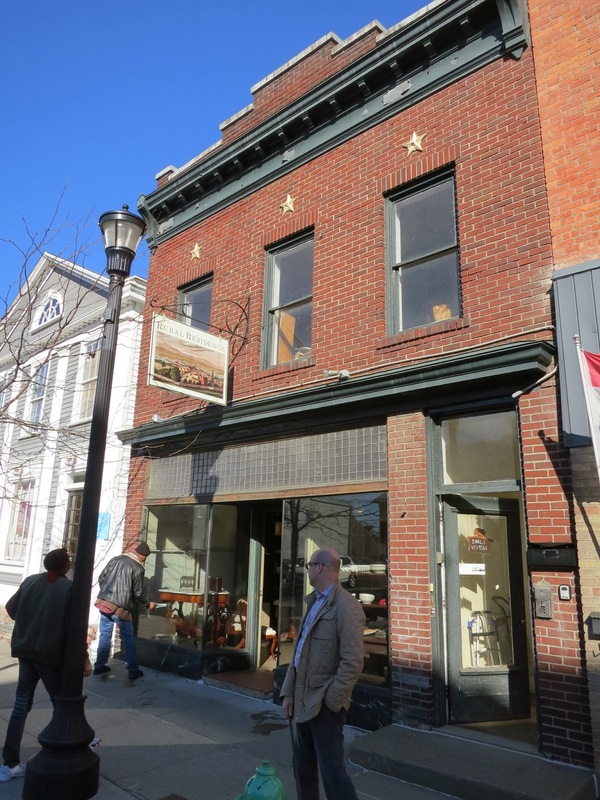 Exploring such emporia is a requirement for us, not only because of our insatiable collecting instincts, but also because Boy's profession as a Fancy New York Decorator demands it. While Reggie came away from our antiques shopping expedition empty handed, Boy found a much sought-after object for a client's Park Avenue apartment, so our visit to the Atlanta's antiques district was not only entertaining, but also profitable. With obligatory antiquing behind us, we then turned to what brought us to Atlanta in the first place: to visit the city's museums and historic houses. Our first stop was the Atlanta History Center, the home of the Swan House. 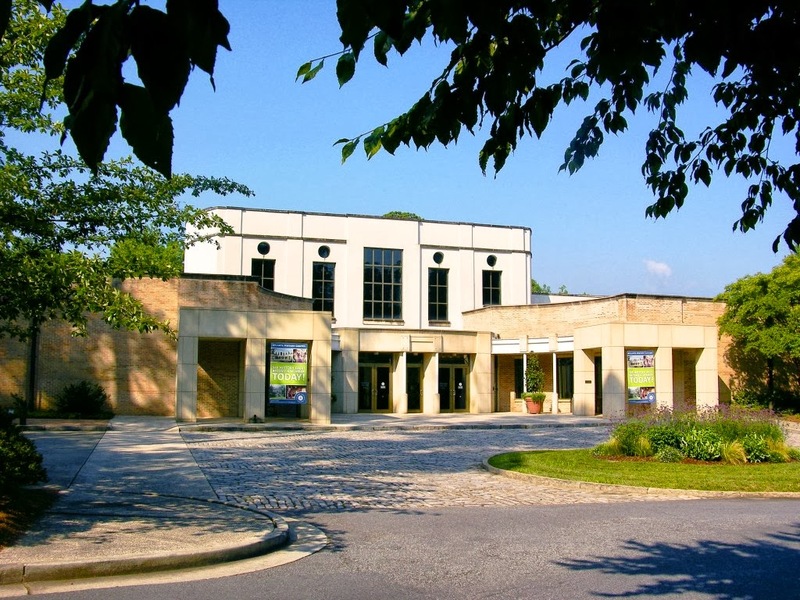 The Atlanta History Center is a handsome Art Moderne building in the swanky Buckhead district. Reggie only learned afterwards, when researching this post, that it was originally known as the Atlanta Historical Society. What is it, I ask, with this madness for renaming venerable cultural institutions with more modern, non-elite names? I still wince whenever I see references to Historic New England, which I shall always consider to be more appropriately named the Society for the Preservation of New England Antiquities, its official name until its board of directors misguidedly decided to rename it, blandly, in an effort to make it sound more "relevant." After touring the Historical Society's History Center's lively exhibitions we made our way to see the two historic houses located on the Society's Center's grounds. The first site we visited, a compound of buildings, was the Smith Family Farm, built in the 1840s by a slave-owning farming family that was moved to the Society's Center's property in the 1970s. The Smith Farm is a fascinating window into the way the majority of slave-owning rural southerners lived in the days leading up to the Civil War and a helpful reminder that not all of the South's agricultural plantations were Spanish-moss-dripping, be-columned mansions. I particularly liked the Smith Farm's separate kitchen building, kitted out in authentic period trappings. We have a summer kitchen/work house at Darlington, ca. 1820, that we are slowly restoring. One day I hope to be able to use it for something other than what we use it for today, which is to store large clay pots and our gas grill during the winter months. 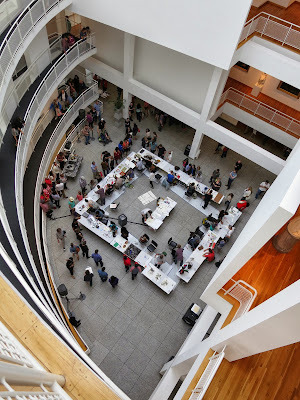 In stark contrast to the Smith Family Farm stands the grand and justifiably celebrated Swan House, designed by Phillip Trammel Schutze (1890-1982), Atlanta's greatest architect of the twentieth century. Built in 1928 for the Inman family, the house has been in the Society's Center's collection since 1966, and is maintained by the Society Center as it looked in the 1930s, complete with original furnishings and period-dressed interpreters. 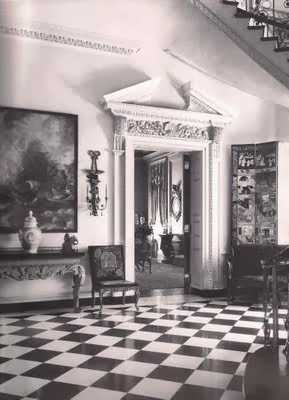 I first toured the Swan House in the 1980s, but this was Boy's inaugural visit. 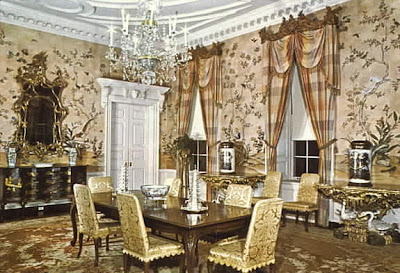 Decorated by the venerable Ruby Ross Wood in the grand English taste favored by the upper classes of the East Coast of America during the first half of the twentieth century, the Swan House is as interesting a window into its occupants as the Smith Family Farm is, albeit at a very different level and under very different circumstances. 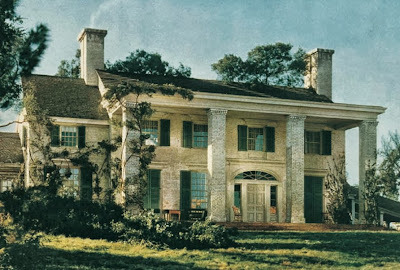 Even though the Swan House was well attended by other visitors the day we toured it, I suspect that its attendance would be dwarfed by the crowds that would flock to Tara, should it actually exist, except in the mind of Margaret Mitchell, the authoress of Gone With the Wind. 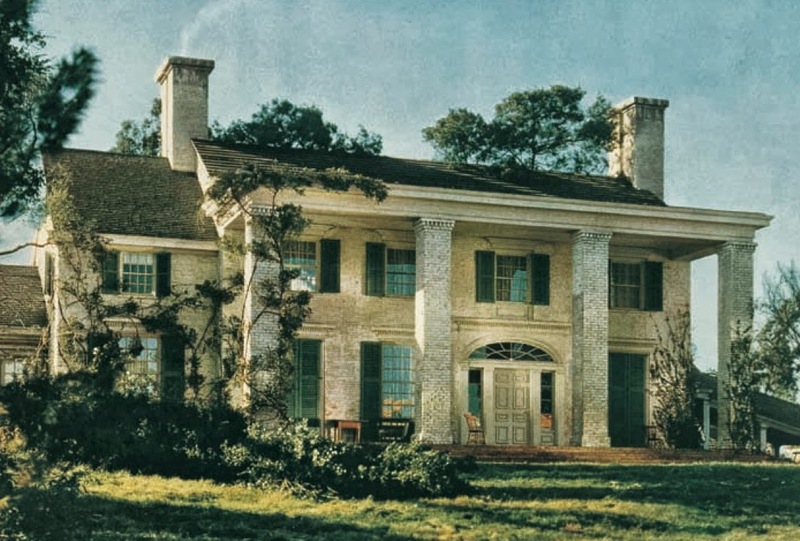 Atlanta (and other cities throughout the South) has more than its fair share of houses built to resemble the film-set version of Scarlett O'Hara's girlhood home that stood (in the book, at least) only twenty-five miles from downtown Atlanta. Speaking of Gone With the Wind, I reread it before, during, and after my visit to the city Scarlett moved to during the war. 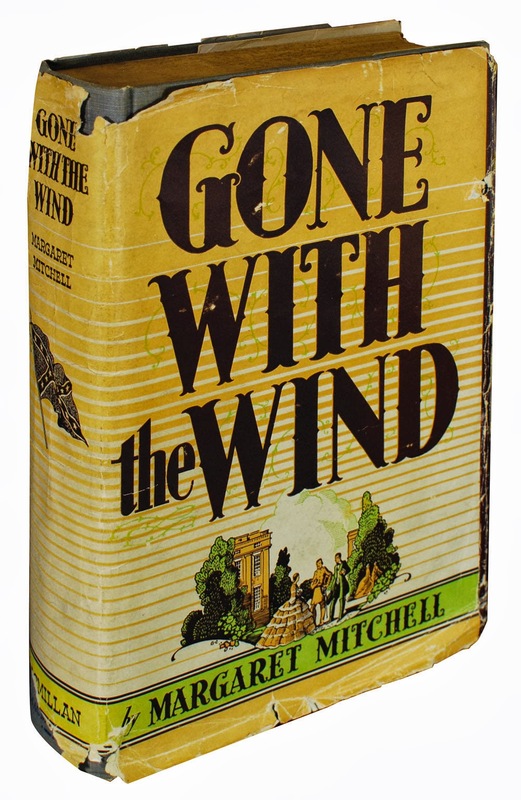 I first read Mrs. Mitchell's best-selling novel in my twenties, and I remembered it as being a rip-snortin', can't-put-it-down, hefty page turner. I'm happy to report, Dear Reader, that it still is, thirty years later. Mrs. Mitchell is a marvelous storyteller, and her characters are vivid and memorable. And funny, too. 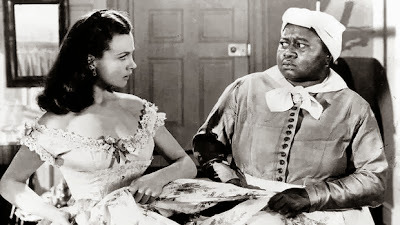 Although Gone With the Wind deals with weighty subjects, it is at times very amusing. I highly recommend it. "I ain't noticed Mist' Ashley askin' for to marry you!" With our tour of the Swan House complete, our thoughts turned to lunch. My friend Elizabeth Tallmadge recommended that we try the Society's Center's Swan Coach House restaurant for its old-fashioned, ladylike Southern fare. After we stopped by it, though, Boy and I decided that we couldn't bring ourselves to go inside, as we were practically trampled by an avalanche of bridal-shower-attending girls and ladies tumbling out of the restaurant, flowers and gift bags in hand. We decided that something a bit more, uh, manly was in order. After driving around Buckhead (in the pouring rain, which continued all day) we finally settled on a Houston's restaurant, closer into town, mainly because it had ample parking right in front of its entrance, a decided plus in a downpour. I had never been to a Houston's before (it is a popular chain, I understand), and I was pleasantly impressed by the one we visited. The food there was quite tasty, the surroundings suitable, and the service very good. The young woman who waited on us couldn't have been nicer or more professional. 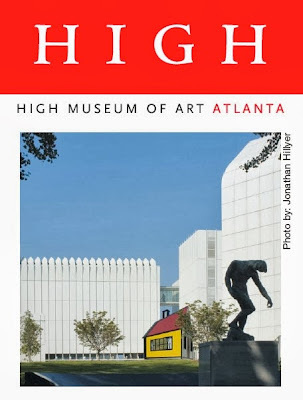 Another one of our reasons for visiting Atlanta was to spend an afternoon at the High Museum of Art. Neither Boy nor I had ever been to it. I was curious to see it, both for its celebrated architecture and its noteworthy collection of art. Our first attempt to visit the High Museum was not successful, however, as the museum's parking garage was full and the wait to get into nearby parking lots was long. That's because the High Museum was hosting a traveling exhibition of Vermeer's paintings that was attracting record crowds. So we decided to drive around Atlanta for a while to see what we could of the city through our rain-splattered car windows. Returning to the museum, we were fortunate to gain entry to its parking garage and tour its collections. We opted not to see the blockbuster Vermeer show, bypassing its crowds and lines. As I've written in other posts, when visiting regional museums I generally prefer to skip traveling exhibitions and concentrate my viewing on the permanent collections. 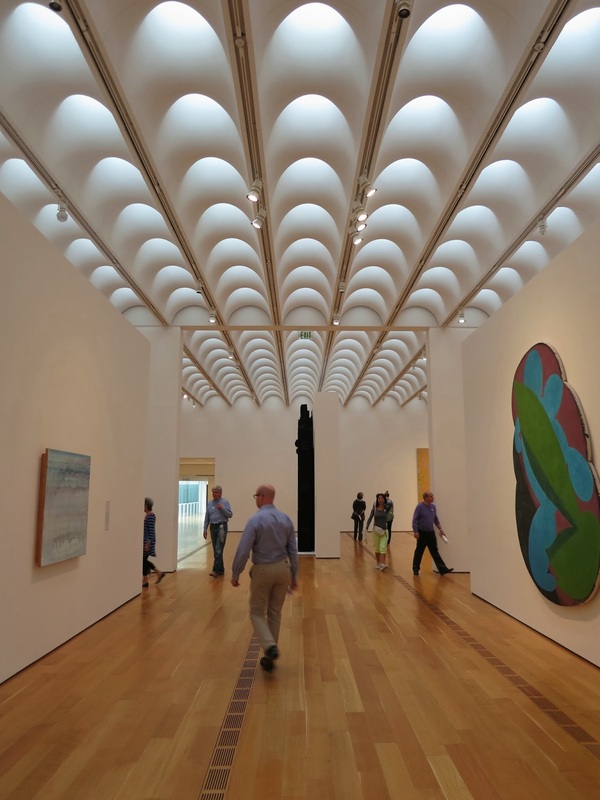 Navigating one's way through the High Museum of Art can be somewhat challenging, as the architecture of the complex takes center stage, relegating the art on display to a secondary note. The galleries containing modern art are the most successful, in my view. The spaces displaying the museum's excellent collection of pre-twentieth century art and decorative arts? Less so. Don't get me wrong, Dear Reader. I enjoyed visiting the High Museum of Art. And so did the thousands of other people who did so the day we were there. The place was hopping! With the "closing-time" gong ringing, Boy and I took our leave of the High Museum and headed out the door with a few hours to kill before meeting up with friends for dinner. So what did we do? 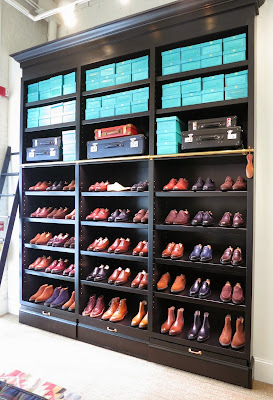 We went back to Sid Mashburn so that Boy could buy a pair of double monk-strap shoes that had caught his fancy the previous day. "Get thee behind me, Satan!" Needless to say, Boy found one or two more must-haves to add to his shopping bag during our second visit at Sid Mashburn . 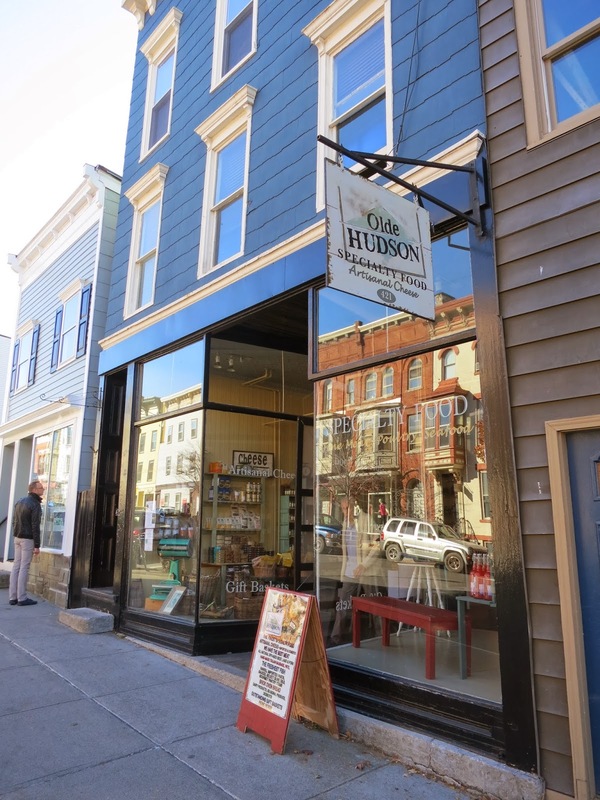 . .
Reggie is most grateful, Dear Reader, that there is not (yet) an outpost of Mr. Mashburn's divine men's clothing store in Manhattan, as he is sure it would hasten the financial ruin of the Darlington household. Albeit a very well-dressed household! Dinner that evening was at the very popular Iberian Pig in downtown Decatur. Organized by our friend Paula Mueller, a group of us gathered there to dig into the restaurant's signature pork-inspired offerings. "The Pig," as it is known by its regulars, attracts a diverse group of Atlantans, ranging from young professionals to the more-pierced-than-thou crowd. The night we ate at the Pig it was absolutely packed and the noise level positively ear-splitting. While I enjoyed the Iberian Pig's delicious, hearty fare, I could barely hear my dinner companions, what with the shrieks and shouting of the surrounding tables of revelers that brought our own table's conversation to a virtual standstill. Nonetheless, I am glad I ate there, as I am fond of the people with whom I shared our table, and the food was quite tasty. Even though we left the restaurant after midnight, I was surprised to find ourselves (yet again) stuck in parking-lot-like traffic all the way back to our hotel. The congestion was due, in part, to crowds of hipsters leaving a huge music festival that took place during the weekend of our visit. While sitting in our idling car, stuck in traffic, it was most entertaining to watch the antics of the music festival's departing attendees, many of whom were lurching about the streets and crosswalks, visibly bombed. Stuck in jammed traffic, again! The next morning, our last in Atlanta, we decided to explore the city's downtown. 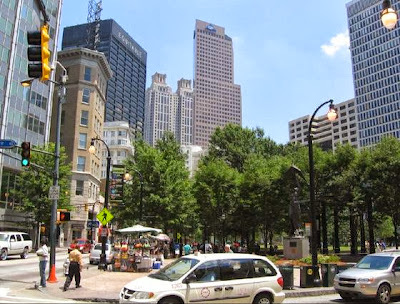 We had spent the bulk of our visit in newer parts of the city and wanted to see what we could find of Atlanta's older, original business and shopping districts. Where it all began, so to speak. 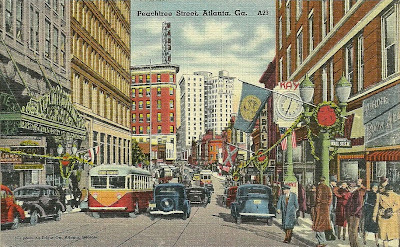 The business district of old downtown Atlanta is largely comprised of office, municipal, and government buildings, a smattering of hotels, and remnants of what had once been a thriving retail district. As is unfortunately the case with many American cities these days, downtown Atlanta is rather gritty and somewhat forlorn, as are many of the people one sees on its streets on a Sunday morning. One is not inclined to get out of one's car and stroll around in downtown Atlanta, taking in the sights. 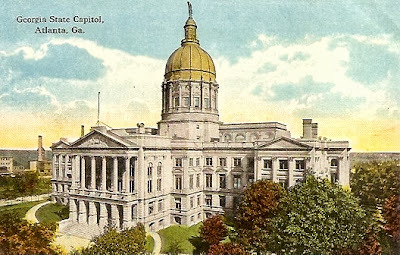 That is particularly so in the blocks immediately surrounding the city's majestic Georgia State Capitol, an area sadly hit with blight, bisected by immense highways and scarred by misguided urban "renewal" in the mid-twentieth century. 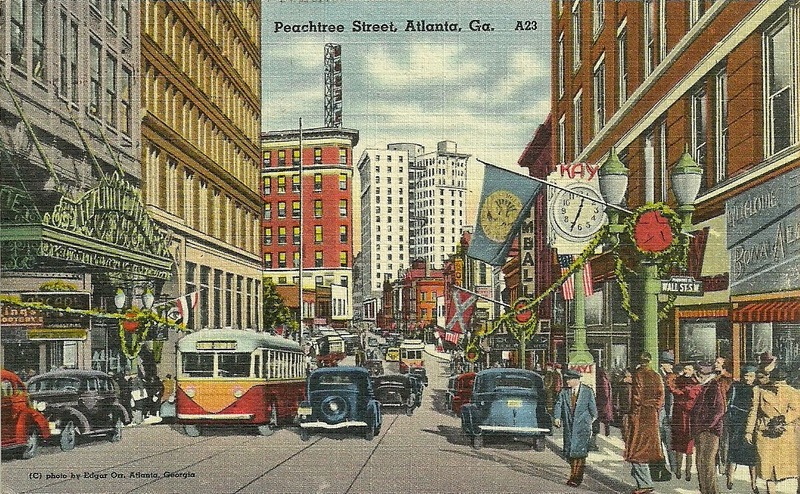 I would love to have seen this part of Atlanta in the 1930s and 1940s, when it was still in all its City Beautiful glory. I'm sorry that much of it is lost to us today except in photographs and old postcards, such as the ones I am showing here. "Would you make that a double, please?" Somewhat sobered by our last few hours touring downtown Atlanta we drove our Cadillac ATS rental car back to the Hartsfield-Jackson Airport to catch our flight to New York. Over preflight cocktails in the Delta Sky Lounge we agreed that we had thoroughly enjoyed our all-too-brief visit to Atlanta, a sprawling, complex, vibrant, and ever-changing metropolis with all the attractions and challenges that large cities in America have today. I look forward to returning to the capitol of the Peach Tree State again and seeing more of what this wonderful city has to offer. 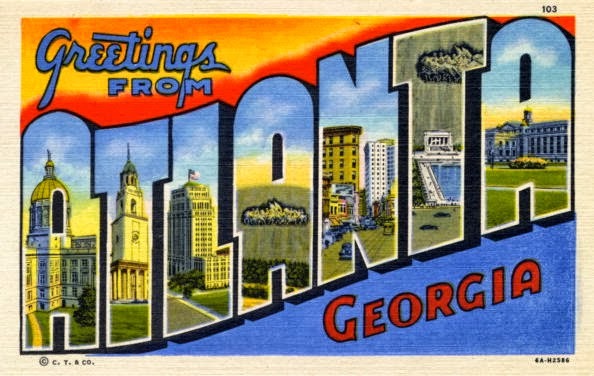 Tell me, Dear Reader, do you have any particular favorite places or things to do in Atlanta that you might recommend? I have much to be thankful for, Dear Reader. Every moment of every day. Sometimes in the rushed and frenzied world of obligations and deadlines that I live in, though, I forget to take a moment to pause and ponder just how fortunate and blessed I am, and to be grateful for it. Today I shall endeavour to do so, throughout the day. I've never been to a Thanksgiving service at the church I sometimes attend, but I'm planning on going today. One of the things I enjoy about our little congregation is that it draws people from all walks of life, some of whom live in very different circumstances than my own. I have much to learn from them. Attending services there helps me keep things in perspective, and I am thankful for that. A tradition I observe at every Thanksgiving meal I attend, whether in my own house or another's, is to ask each person at the table to share what it is they are most thankful for this year. I'm always intrigued with the window this provides into my table companions' lives. More often than not, what people share provokes murmurs of agreement from those of us at the table. Sometimes we respond with laughter, and sometimes we respond with tears. So, what am I most thankful for this year, you may ask? That my dear sister Camilla, who has lived in pain for many years, is now mending. I am grateful that modern healthcare is making that possible for her. I do so love my darling Sister. This year it is just the two of us at Darlington for Thanksgiving, by choice. 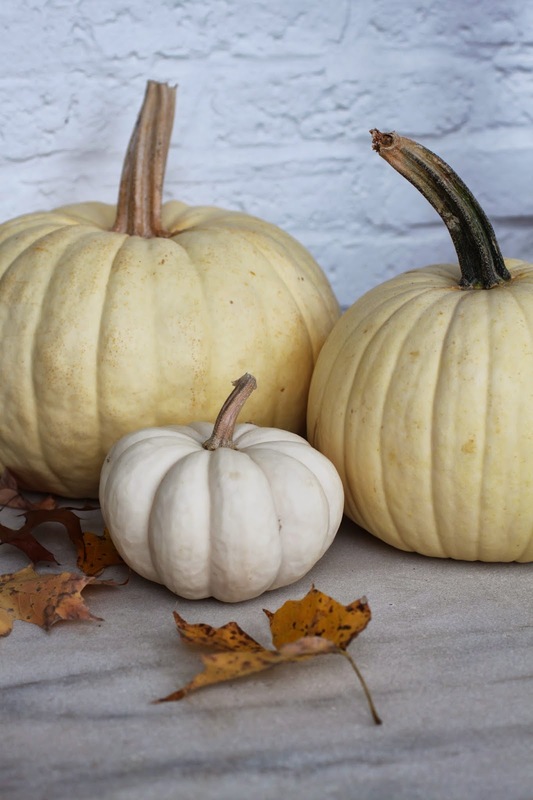 I've been on a mad dash for much of the autumn, and the prospect of four days of quiet home life is something I have looked forward to, if not yearned for. Times of unhurried reflection are some of the most regenerative and nourishing ones, I find. 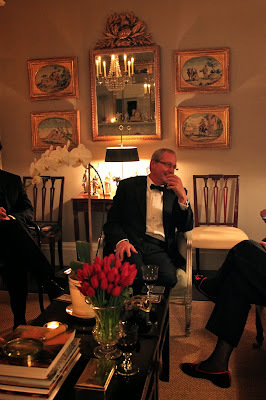 Today's post, the first of two, discusses the planning and preparations for a dinner party that Boy and I hosted at Darlington House last weekend. I thought it might be of interest—at least to one or two of my Dear Readers—for me to share just how we do it here at Darlington. One afternoon a month or so ago I said to Boy that I was itching to have a dinner party to celebrate the arrival of autumn, and to entertain a group of friends—some of whom we knew well and others we'd like to know better—to an evening of pleasant conversation, flowing libations, and delicious, hearty fare of the season. Throwing a successful party, in Reggie's view, requires planning, forethought, teamwork, and effort. Although a party can be a casual affair, where guests freely mingle and help themselves to drink and food laid out at a buffet, one must never confuse "casual" with "effortless." The term "effortless entertaining" is a particular pet peeve of Reggie's, and it sets his jaw on edge whenever he all too frequently comes across it in magazines breathlessly describing the entertaining styles of certain social animals. Believe me, Dear Reader, "effortless entertaining" is a fantasy concept, indeed. For a party worth attending doesn't just happen. It requires work. And why shouldn't it? Anything worthwhile requires effort to achieve. Fortunately Reggie enjoys all the preparations and planning that go into a creating a successful party. He finds it fun. One's enjoyment in undertaking such efforts is helped, though, when one is able to share said labors with others, at minimum with one's spouse, and—when possible—with one or more professionals employed to assist in making said event a well-run affair. When Boy and I entertain at Darlington House, we gauge the level of assistance we require by the number of guests invited and the type of entertainment provided. When we have another couple over for cozy supper of four, we take care of it entirely by ourselves, setting the table, cooking and serving the meal, and washing up afterwards. When there are six of us, though, we hire someone to help us out with the final food preparations in the kitchen, serve at table, and clean up afterwards. When there are eight or more we surrender the cooking entirely to a chef, who is usually supported by an assistant and where the guests are attended to by at least one, and sometimes more, servers. That way we get to enjoy our own party, rather than be enslaved by it. of Cedar Farm are so close to home? Since we determined that there would be a total of ten of us at table for this dinner party, our first step was to contact our beloved caterers, Christine Jones and Bert Goldfinger of the Red Barn, who've helped us out with many parties, to see if they were available (and willing) to cook for us. Once we determined that they were (Hooray! ), we enlisted the help of a woman who helps us serving at parties, to see if she was available to attend to our guests, and were delighted that she was. Once we had the staffing of the evening in hand, we turned to assembling our guest list. We invited a number of people who had entertained us who we liked and wished to return the favor to (see Reggie's Rules of Social Reciprocity), and we also invited some people we had never entertained before (two recent arrivals in the area, one of whom I first met twenty or more years ago), with the end result being a mix of singles and couples. With guest list in hand, I picked up the telephone and started calling my hoped-for guests to invite them. Please note, Dear Reader, I did not impersonally email or text my invitations, I telephoned them. For when throwing a dinner party one should always strive to invite one's guests telephonically, in order to personalize said invitation. Of course when throwing larger parties, say cocktails for fifty, it is understood that one sends out invitations via the post office (or, increasingly these days, by Paperless Post). Once our guests had accepted, I then sent them reminder cards (in the mail) one week ahead of the party with the requested arrival time noted, as well as the dress. For this dinner party we asked the men to wear jacket and tie. It seemed a bit too early in the season to force ask our guests to haul out their formal wear for a country dinner party. On a parallel path with assembling our guest list we met with and had any number of telephone and email exchanges with our caterer to come up with a menu for the evening that was appropriately autumnal, and decidedly delicious. As I've written elsewhere, Boy and I are of the school of entertainers who shy away from serving over-handled and fancified food at dinner parties. We and our friends eat out in restaurants all the time, to the point that it really isn't all that special. But it is special to be invited into someone's home for a dinner party these days, since so few people have them anymore (or at least invite us to them when they do!). When I either give or go to a dinner party, what I really want to eat is what has come to be known as "comfort food." And that's what we serve at Darlington House dinner parties—unfussified "home-style" cooking made with care and from the best available (ideally local) ingredients. Not one's mother's plain, everyday get-it-on-the-table cooking, mind you, Dear Reader, but rather dressed up comfort food. 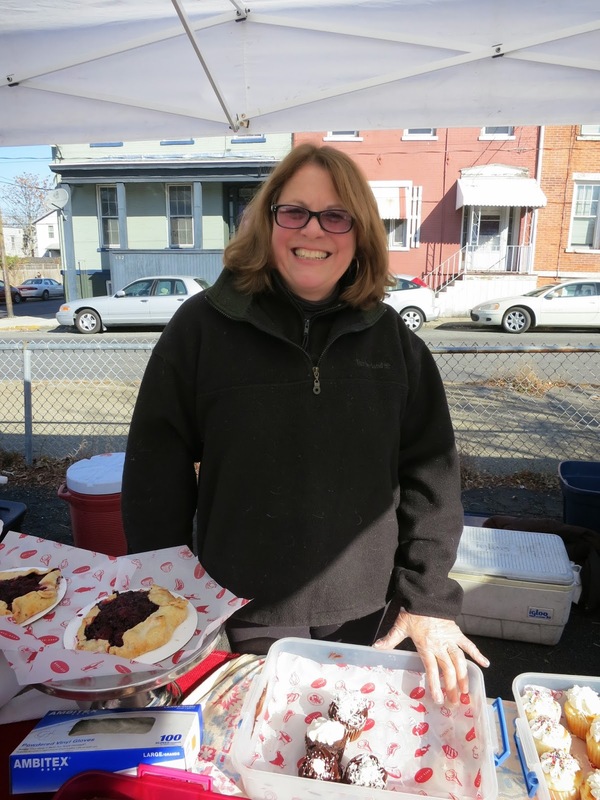 While we were planning the menu with our caterers we also contacted Marilyn Cederoth of Cedar Farm Wholesale. Marilyn helps us with flowers at Darlington House. 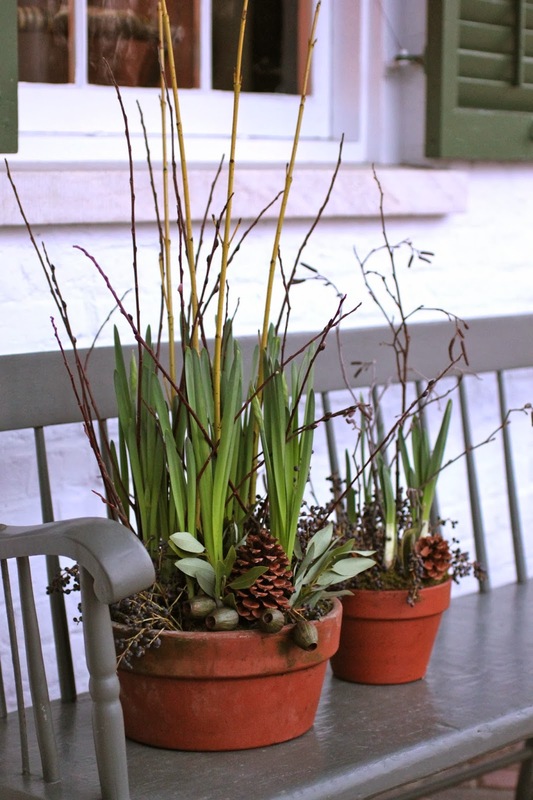 We arranged for her to come by the house the day of the party to fill the Chinese urns in our drawing room with autumnal branches and to provide arrangements for the dining room table and the table in our entry. The day before the party our groundsman/handyman/all-around godsend, Rich, brought in a crew and did a thorough leaf clean up and tidying of the property, so it would be in tip-top, manicured shape for the party. We also contacted our favorite wine merchant in the area, Michael Albin of Hudson Wine Merchants, to put aside cases of white and red wine, and also one of champagne, and a replenishment of the bottled liquor we like to have on hand at parties. Reggie also stopped by a specialty food court near his office in midtown Manhattan to pick up some before-and-after-dinner treats to augment the already planned food and drink. With these and other advanced arrangements taken care of, we then drove up to Darlington from the city on Friday night, ready to embark on the preparations the next morning in order to be ready for our guests when they arrived on Saturday evening.